Surveyed provinces: Agri, Amasya, Ardahan, Artvin, Bartin, Bayburt, Bingöl, Bitlis, Bolu, Düzce, Elazig, Erzincan, Erzurum, Giresun, Gümüshane, Hakkari, Igdir, Karabük, Kars, Kastamonu, Kayseri, Malatya, Mus, Ordu, Rize, Samsun, Siirt (GD), Sinop, Sivas (OA), Tokat, Trabzon, Tunceli, Van ve Zonguldak. Archaeological periods surveyed: Palaeolithic/Epipalaeolithic, Neolithic, Chalcolithic and Early Bronze Age (EBA). Distribution of types of destruction over documented sites*: 164 Illicit digging/treasure hunting, 120 Agriculture, 87 Dam, 69 Illicit digging+Agriculture, 58 Contemporary settlements, 38 Agriculture+Contemporary settlements, 27 Illicit digging+Contemporary settlements, 14 Natural causes, 8 Highways, roads, bridges etc., 4 Other. As shown in the statistics, destruction by illicit digging and treasure hunting constitutes the majority of archaeological destruction in the Black Sea and Eastern Anatolia regions. 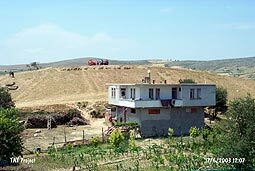 The illicit digging, particularly in Eastern Anatolia, is executed by bulldozers which totally destroy the stratification of settlements. Treasure hunting is most commonly observed in Van, Siirt, Mus, and Tokat/Zile. Usually, the secondary cause of destruction for both regions are agricultural activities. Destruction by field enlargement and by leveling mounds to combine fields are not given a second thought due to the ignorance and apathy of locals. Settlements with single layers in particular are heavily destroyed, even demolished. In the Western Black Sea region (Amasya, Samsun, Sinop, and Kastamonu), destruction dealt by administrative organizations such as Rural Services, State Hydraulic Works and the Highways service is astounding. It is very disturbing also to find out that public vehicles were used in the destruction of settlements by illicit digging. 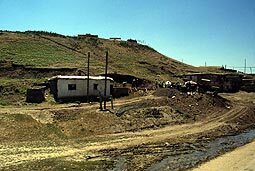 In Eastern Anatolia, particularly in Elazig and Erzurum, destruction by unplanned construction is widespread. Many modern villages were established on archaeological sites, and there was, and still is, a huge amount of soil removal. Unfortunately the location and original dimensions of mounds now only live in the memories of the older people. Agriculture: All kinds of agricultural activity (cultivation, terracing, leveling, soil removal, irrigation channels etc.) on and around the mounds. Contemporary settlements: Houses, hotels, recreational areas and holiday complexes, petrol stations, factories, dams, power lines, pipelines, cemeteries etc. built directly on the mounds. Illicit digging/ treasure hunting: By locals and smugglers. Mines/quarries: Stone, sand and lime mining on and around the mounds. 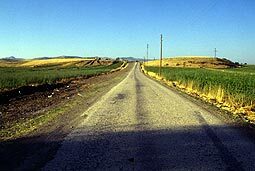 Highways/roads: Highways and country roads passing over or through archaeological sites, bridges built upon sites and soil removal from the sites to be used in the construction of such. Natural causes: Earthquakes, forest fires, soil erosion, riverbed reformations, floods etc. Other: Antique settlements, tumuli etc. 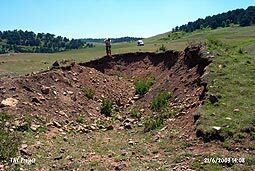 Degirmentepe (mound) (Mus/Bulanik): A legal treasure hunt was conducted in 2002 on the southwest slope of this mound which took only 10-15 days. That was more than enough time to roll in the construction machines, displace large amounts of soil, and completely obliviate the several thousand year old mound’s slope. Such excavations, though ‘legal’, are carried out by people who are not archaeologists and who have no intention of conducting research. 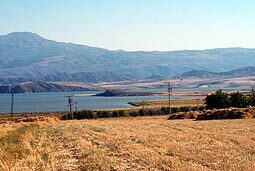 Alisar (mound) (Malatya/Battalgazi): This EBA mound used to be a pretty large hill, but the owner of the plot had people from the Rural Affairs Directorate flatten the area to make way for fields which were to compensate him for some of his land that was submerged ten years ago under a reservoir nearby. The N and S slopes of the mound have been completely cut away. 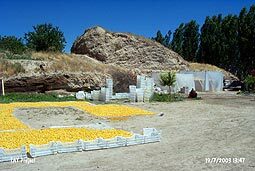 The owner dries his apricot harvest on the W side, and any areas that aren’t useful to him have not been left to rot by the ‘lootures’. 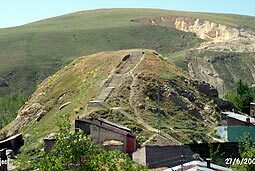 Askale (mound) (Erzurum/Askale): The City of Askale built a concrete staircase on this EBA mound. The 123 step journey to the top of the mound greatly facilitates travel from the houses on the northeast slope of the mound to the top of the hill. 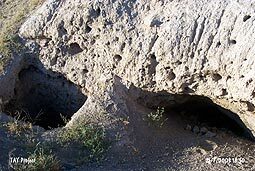 Bahri (mound) (Malatya/Battalgazi): Looters have intricately carved the surface of this c. 5000 year old mound to make it look like a cave. In addition, the south and southeast slopes have been cut for agricultural reasons. Despite the extensive destruction, however, the mound is still easily discernable amid the planted fields, for now. 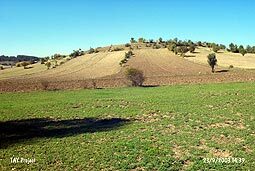 Bolus (mound) (Tokat/Çamlibel): This large and broad EBA mound has been dealt heavy damage from construction and agriculture. Quite a few houses have been built on the E and N parts of the mound, and a lot of soil has been extracted from the W slope. 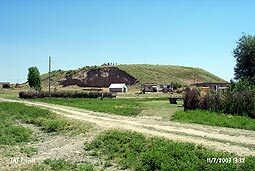 The N part of the mound is enclosed with barbed wire and has some structures in addition to a water tank, a cemetery, and a dirt road that goes all the way to the top of the mound. 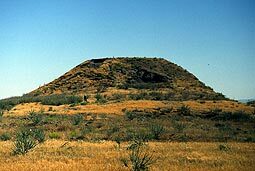 Perhaps the most interesting thing about this mound, however, is the fact that it lies within a protected zone. 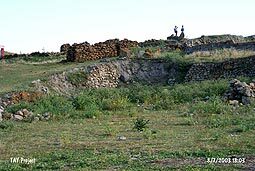 Çamurlu (mound) (Sivas/Gemerek): Concentrated efforts by looters have thoroughly destroyed this c. 7000 year old Chalcolithic mound. Among the many pits opened, which average around 2 m in depth, is a particularly interesting one that probably breaks all records in the history of looting, for this very special cut(!) stretches in a WSW-ENE axis like a trench for a total of 23.5 m! We can clearly see what it has done to this piece of cultural heritage which should be preserved for future generations. 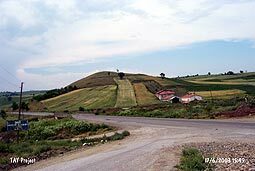 Çes Tepesi (mound) (Samsun/Havza): The north-northeast side of this EBA slope settlement has had quite some soil moved by heavy-construction equipment to make way for fields. While the settlement clearly demonstrates the effects of agricultural destruction, looters have pockmarked the southwest slope. 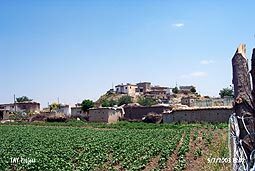 Çinaz I (mound) (Elazig/Kovancilar): The northwest slope of this rather large EBA mound has been terraced by heavy equipment, allowing for the planting of a vegetable garden. 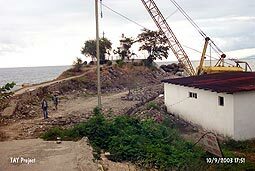 Earth-movers, those most villainous enemies of mounds in the Eastern Anatolia and Black Sea Regions, then advanced to surrounding parts, preparing the site for a new house, the construction of which was started two months ago. 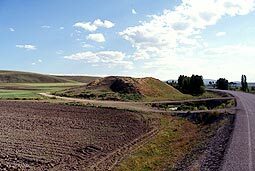 Degirmenler Höyük (mound) (Erzurum/Merkez): This 5000 year old EBA mound has been completely destroyed. Its top has been flattened and houses in the southwestern section of the neighboring village have been built on the slopes of the mound. The road that connects this village to the neighboring one is also partly built on the northeast slope. 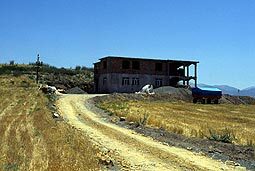 Dilkaya Höyügü (mound) (Van/Merkez): Archaeological excavations in the past have apparently not helped locals understand the importance of this c. 5000 year old mound, as its destruction has continued at full throttle. A large looters’ trench starts on the south-southwest slope and makes its way west, re-emerging with a nice vista of the Lake Van. In addition to a house built on the north-northeast slope, it is important to note the natural destruction dealt to the mound by the lake. 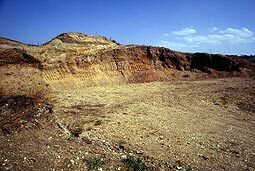 Dizik Höyük (mound) (Elazig/Maden): This c. 5000 year old mound has been completely disfigured by the amount of earth extracted from all of its slopes. The NW slope in particular was stripped of all of its fill, exposing cultural layers on the resulting wall. There are numerous looters’ trenches on what remains, in addition to a pretty broad road circumnavigating the mound which was presumably built to facilitate the destruction. 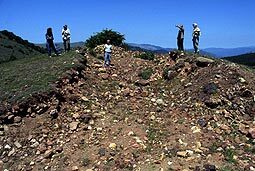 Firislik (mound) (Ordu/Mesudiye): Another example of the many unfortunate mounds visited by the Black Sea Region’s earth-moving machines. Villagers told us the event took place in 1997 and left little behind in terms of slopes. A massive cut performed on a north-south axis by the infamous ‘955’ machine means that there is almost nothing to be seen from this c. 5000 year old mound. The whole episode once again demonstrates what a sudden and irreversible concept archaeological destruction is. Gediksaray Höyügü (mound) (Amasya/Göynücek): This c. 5000 year old EBA mound is cut in half by the road that connects the village of Gediksaray to Amasya. The remaining two smaller hills are further assaulted by looters as well as by agriculture. 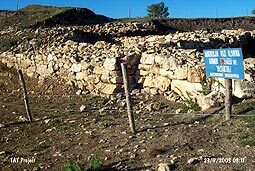 Güzelova (mound) (Erzurum/Dumlu-Merkez): Nothing remains of this Chalcolithic mound on which archaeological excavations were conducted in 1961. A 1985 publication reports the mound as being 12.5 meters high (as tall as that telephone pole in the picture), adding that it was under serious risk of destruction. Today, however, due to the non-stop extraction of soil, the mound site lies even lower than the houses that surround it, making it a unique ‘pit-mound’. Hacibaba Tepesi I (mound) (Samsun/Bafra): Building activity and the extraction of soil to support it have spelled doom for this EBA mound. It is one of those examples where there is not much to say regarding the picture other than ‘no comment’. 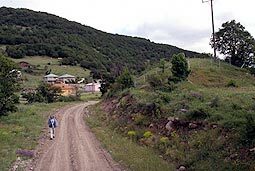 Hindiköy (mound) (Bayburt/Demirözü): Despite flat terrain all around it, planners intended to route the Bayburt-Demirözü highway (built in '99) right through this EBA mound. Thankfully, a villager from the nearby Sögütlü persuaded them to re-route around the mound. The presence of locals sensitive to cultural preservation can not always save a settlement. Despite being just saved from being run over, the common practice of being used as a source of soil which has almost totally destroyed it. 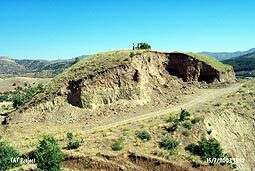 Kabayar Höyük (mound) (Amasya/Tasova): An EBA mound that faces total obliviation from several sources, the c. 5000 year old Kabayar Höyük has been severely damaged by a road on its north side. What remains of the mound is subject to continuous agriculture which shaves a few feet off of it every year. Almost 3/4 of the southeast slope has fallen prey to the natural force of Yesilirmak and, to top it all off, a series of electric utility poles have been erected on the mound. 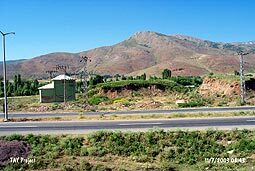 Kaleciktepe (mound) (Erzincan/Merkez): Once dated to c. 5000 years ago, the mound no longer exists, as it has vanished under the a drainage/irrigation channel leading to a dam built on the Göyne River. Salvage excavations were conducted at the site prior to the start of construction in 1996. The mound supposedly lay at the convergence point of the channel and reservoir. After the many mounds submerged by dams built by the State Hydraulic Works, this is a new category, as it was submerged by a dam’s auxiliary services. 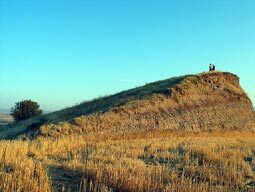 Kekerli (mound) (Mus/Bulanik): Conveniently placed amid the houses of Kirkgöze, this mound is open for public use! In addition to the heavy damage caused by the houses that surround it, the mound also plays host to utility poles, two wheat pits, and a stone wall on the northeast side. What remains is not wasted, as it serves the village’s departed in the form of the village cemetery. 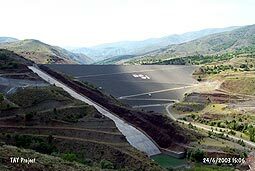 Kinik (slope settlement) (Kastamonu/Devrekani): The EBA settlement lies within the construction zone of Kulaksizlar dam. Archaeological excavations were carried out in 1994-95, after which the settlement was enclosed with barbed wire by the municipality. Signs reading “Archaeological Excavation Zone, No Trespassing!” have enjoyed massive success, but not in the way they were intended to. ‘Black Sea Looters’ invited by the flashy advertising dug two big pits on the east side of the mound right outside the enclosure. 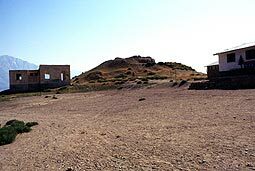 Kirtakom/Tabanli (mound) (Mus/Merkez): Cultural layers on this mound, which goes back some 5000 years, have been completely destroyed. Slopes have been cut to make way for houses, taking with them most of the aforementioned layers. Until as recently as three years ago, soil was extracted from these pits for the roofs of nearby buildings. Before its destruction, Kirtakom was apparently a very large hill. Kömüs/Bozbulut (mound) (Mus/Yaygin): Villagers of Kömüs rented this EBA mound from the local government. The northeast slope of the c. 5000 year old mound lost some fill, and a water tank was also built. While we were conducting our fieldwork, construction of the village imam’s residence, on the mound, was in full swing. 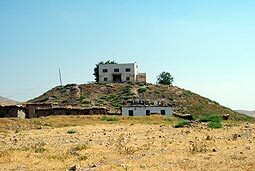 Kösk Höyük (mound) (Sinop/Gerze): Situated on a rocky outcropping, this EBA mound now has a lighthouse on it. Further building activity on and around the mound is evident in the photograph. 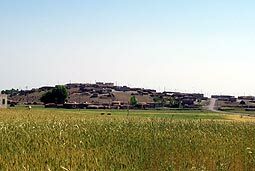 Kunduz (mound) (Tokat/Artova): This mound is said to have been tall and conical. Today it is low and broad, with intense agriculture following the displacement of large amounts soil by looters with heavy machinery at their disposal. What little is left of this mound probably won’t be around for much longer. 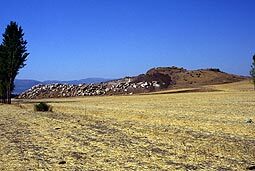 Laafçilar Agili Höyügü (mound) (Sivas/Zara): The EBA mound lies amid intense agriculture, and its surface has been thoroughly damaged by looters. The many trenches opened up on the south side of the mound must have yielded lots of treasure, for the looters don’t seem to have gotten bored of pointlessly and indefinitely digging. 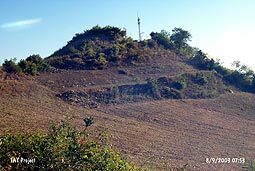 Later/Elmakaya (mound) (Mus/Bulanik): Yet another EBA mound that couldn’t save itself from treasure-hunters! We’ve counted no less than twenty looters’ trenches on this c. 5000 year old mound, the largest of which was a whopping 20x10 meters crater. Locals too dig this mound, we’ve learned, and it was not even possible to discern its exact dimensions due to the massive damage. 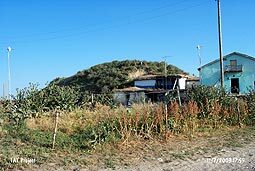 Liz/Erentepe (mound) (Mus/Bulanik): This settlement has houses from the village of Esentepe all over it, which makes it impossible to define the boundaries of the c. 5000 year old mound. 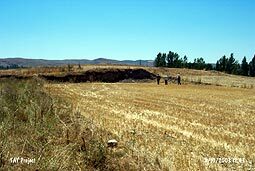 Maltepe Höyügü (mound) (Elazig/Baskil): Another example to the irreversible damage dealt to archaeological settlements by looters, this c. 5000 year old EBA mound was excavated so extensively that it is almost level with the surrounding terrain. There is a wide gap in the north side along with numerous other pits of various sizes. Given all this, one could easily say that thousands of years in cultural layers are just as lost as the village that was once there. 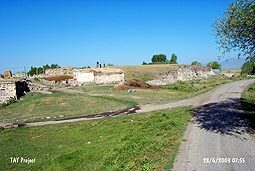 Manevra Tepe (mound) (Samsun/Havza): The Directorate of Highways and the local municipality removed much of the fill on this EBA mound to be used in the construction of the road that passes just by the site on its west side. Cultural layers thousands of years old were thus lost, as almost nothing remains of this mound. Masat Höyük (mound) (Tokat/Zile): With a height of 28.8 meters when scientific excavations were taking place, this EBA mound used to be one of the largest in the region. Continuous agricultural activity has caused it to gradually get lower and broader. Another very important mound with an uncertain future. 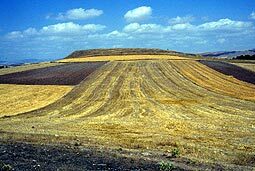 Musuri (mound) (Agri/Merkez): This EBA mound is trying to survive in the face of three different kinds of threat. It is surrounded by fields, and the mound itself is also planted, which makes it impossible to discern the exact boundaries. 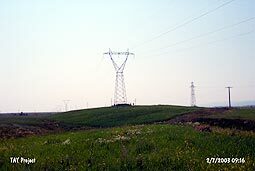 High-tension electricity lines cross the mound, with post # NHGM-265 located directly on the mound and two smaller posts located parallel to the lines south-southeast of the large post. Looters, probably thinking that this much destruction didn’t quite cut it, have assaulted various parts of the mound. Mülkbükü (mound) (Amasya/Tasova): Researchers reported agricultural disturbance in a 1996 publication. As of 2003, only about half of the mound remained. Roughly c. 5000 years’ worth of cultural fill has been destroyed to make way for more fields. There is also a road on what was left behind. Orman Mektebi Höyük (mound) (Bolu/Merkez): Studies made in 1942 dated this mound to the Chalcolithic and reported it as standing 5 meters tall. Today, other than its name, there is absolutely no trace of the mound! 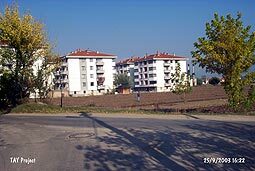 10 storey apartment blocks were built on the site about 15 years ago, and parts of it were flattened to make way for fields that are still planted. The exact location we think the mound was at is now the site of a highway that goes to the center of Bolu. Oymaagaç Höyük/Höyüktepe (mound) (Samsun/Vezirköprü): Villagers of Oymaagaç plant tobacco all over this c. 5000 year old EBA mound. The west slope has been terraced and the east slope has a house on it that was built a few years ago. 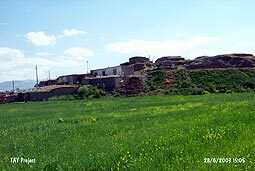 Pulur (mound) (Erzurum/Merkez): Yet another settlement that has been heavily damaged by the structures on it. Most of this c. 7000 year old Chalcolithic mound lies beneath the houses of the village of Pulur, the only exception being the north slope. Earth used in the construction of these houses was also extracted from the mound, creating a large pit at the top. 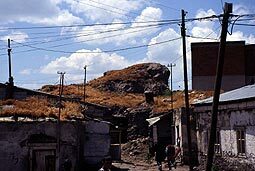 Siirtan (mound) (Siirt/Kurtalan): This settlement, first inhabited in the Chalcolithic, still has people living on it. Dwellings from the village of Çayirli cover the N, S, and E slopes of the mound while the W side is too steep for this purpose. Instead, probably because the view is unobstructed on this side, a duplex house with its own little garden was built right on top of the mound. Also featured on the mound are a road, two telephone posts, and a water tank built by the directorate of rural affairs for the use of nearby houses. Sivritepe (mound) (Samsun/Alaçam): This c. 5000 year old EBA mound is heavily damaged due to construction activity. 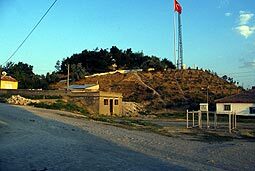 Its lower slopes have been cut to make way for fields while its summit features a TV broadcast tower, an Atatürk plate stabilized in the soil beneath, and a road that connects to area to Alaçam in the north-northwest. 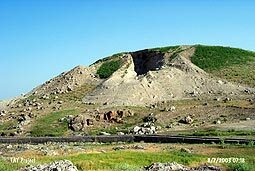 Türkertepe (mound) (Mus/Merkez): This EBA settlement, just on the S side of the Mus-Bitlis highway, is recorded as a pretty large mound, now facing a total obliviation. 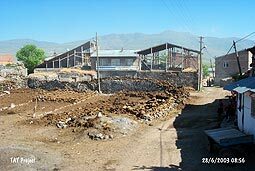 The municipalities of Mus, Yonca, and Hasköy have all extracted great amounts of soil, and they are still carrying on. Mus’s industrial zone constructed with soil from the mound. There is large electricity substation on NE slope. The numerous cuts have revealed cultural layering clearly, and the municipal government of Mus dumps rubble over it all. 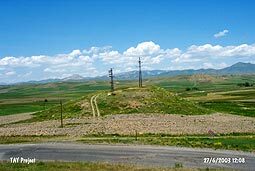 Sos Höyük (mound) (Erzurum/Pasinler): This EBA mound, where archaeological studies have taken place in the previous years, now lies completely under its namesake village, Sosköy (now called Yigitbasi). Still a pretty large hill, the mound has been used as a source of soil for quite a while, and the encroachment of buildings is evident in the picture. Sarkisla Merkez Höyük (mound) (Sivas/Sarkisla): This c. 7000 year old Chalcolithic mound is now a hill that serves a variety of purposes. The south side is an outdoor coffeehouse, the north features a water tank, and the NE has been covered in concrete to serve as a garbage dump. On the summit is a mobile phone base station, a flag pole, an upright rock structure of some sort, and square shaped poured concrete. 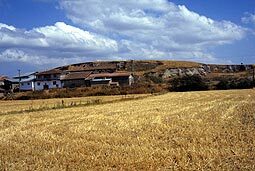 Seyhsafi Höyüktepe (mound) (Samsun/Havza): Perhaps after so many examples of agricultural, structural, and other kinds of destruction, we should not be surprised that yet another mound has fallen prey all of the above. The mound is continuously losing some of its fill to agriculture, and we found a pretty old looters’ trench to top it off. 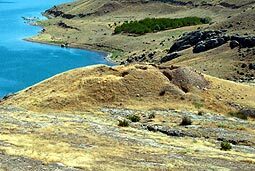 Taskun Kale (mound) (Elazig/Merkez): With a diameter of 150 meters and a height of 20 meters, it is known that this is one of the largest EBA mounds in the area. Rising water levels after the construction of a dam nearby has submerged all but the very summit of the mound which is now an islet. 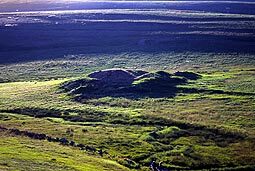 Like many other settlements facing a similar fate, this mound and the culture of those who inhabited it some 5000 years ago are about to be permanently lost. 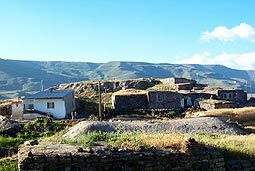 Telliban-Bozuk Köy (mound) (Siirt/Kurtalan): The contemporary village of Bozhöyük is built directly on top of this c. 7000 year old Chalcolithic mound which has totally destroyed the cultural layering. 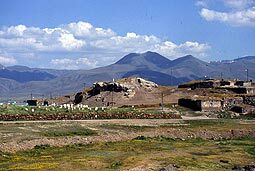 Tepecik (mound) (Erzurum/Pasinler): Yet another mound on which there is still habitation... 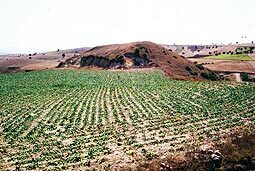 The slopes of this mound dated to the EBA are terraced, cut, and harvested for soil. There are numerous buildings on its south-southwest side, including one that is currently under construction. Tepeler (Konk) Höyügü (mound) (Ardahan/Merkez): Another example in the long list of mounds pockmarked by looters’ pits is this one from Ardahan. The looters in question must have gotten some serious intelligence as to the presence of treasure in this mound since they’ve consistently searched all over it, including the area where there are the remains of a tower-type structure. Tilkitepe Höyügü (mound) (Erzurum/Ilica): One can see evidence of several different kinds of destruction at this c. 5000 year old mound. 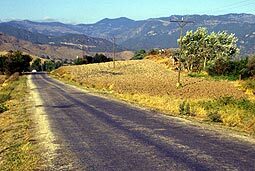 The slopes of the easily discernable hill have been ploughed, a road has been built that goes from the south-southeast slope up to the summit, and there are two utility poles near the road. 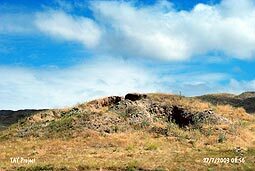 As is the case with any such hill that is easy to identify as a mound, there is heavy looting damage as well. 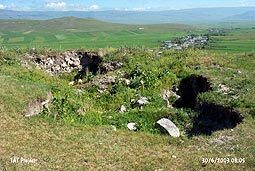 Uluova (mound) (Elazig/Sivrice): This c. 7000 year old mound is where damage by building and looting activity is among the most obvious. Earth-movers took large amounts of soil from the slopes of the mound, an action that exposed cultural layers on the now pretty steep sides. The top of the mound has been completely destroyed by many large pits also opened by construction machines. On the NW end is a another pit which we thought might be a water pool, for it is lined with rocks and concrete. 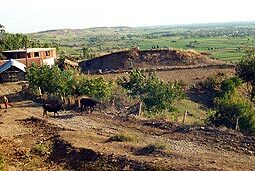 Üyüktepe (mound) (Kastamonu/Merkez): This c. 7000 year old Chalcolithic mound has seen agricultural activity for a long time. The largely destroyed settlement has been split in half by a stone wall. The NNW side has been cut and flattened, causing a three meter difference in height between the two sides of the mound. 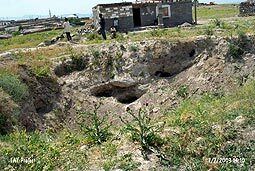 With its numerous looters’ trenches and artifacts scattered around ploughed fields, Üyüktepe is probably a pretty important settlement that is under a severe threat of total destruction. 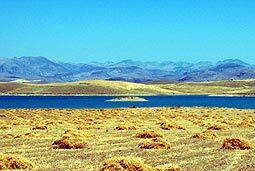 Yarimca (mound) (Elazig/Merkez-Içme): The Yarimca settlement, dated to the EBA, was submerged under the waters of Yeniköy Dam built some 25 years ago by the municipality of Yarimca. During the drier months of September and October, when water levels are at their lowest, the top of the mound becomes visible and reminds us that yet another savagely destroyed settlement lies beneath the waters. 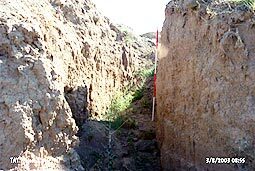 Yayla Höyük (mound) (Ordu/Mesudiye): Looting problems at this EBA mound were mentioned in a surface survey conducted in 1991. It seems that the mound was never given a break from earth movers, as those infamous machines trampled the settlement 6-7 years ago, totally messing up the cultural layering and leaving behind almost nothing in terms of cultural remains. Ziraat Tepesi (mound) (Ordu/Mesudiye): The SSW slope of this EBA mound was completely cut to make way for a road. The site, which also features a family burial and electric utility poles on its top, is enclosed by a fence. 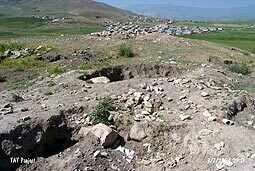 Zülfübulak (mound) (Van/Muradiye): An EBA settlement that has been completely overrun by looters! We’ve managed to count no less than 61 (sixty-one!) pits on the mound that were scattered all over. Villagers told us during our fieldwork that they opened these trenches “to quarry stones.” Simply put, the mound faces destruction due to rampant apathy and ignorance. Tanindi, O. - A. Dilsiz - D. Uygun et al., 2004, Archaeological Destruction in Turkey, Year 2003 Preliminary Report – Black Sea and Eastern Anatolia Regions, TAY Project - Scientific Reports Series 15/Eng, ISBN 975-6637-14-5, Istanbul.